After the new picture-heavy Facebook profile was rolled out earlier this month, some savvy web designers figured how to use the rectangular profile pic and the row of five recently tagged photos in order to create one unified effect right across their Facebook profile page. 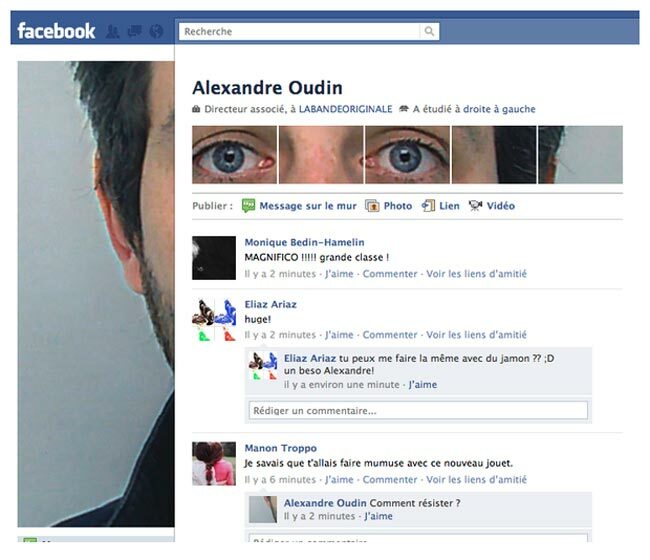 This was then adopted by French artist Alexandre Oudin who worked with the new layout to make a picture of his eyes and face spill across his page, as pictured below. If you like the effect that is created by this a new application called Profile Maker can help you easily make your photos look like Oudin’s profile layout. The new Profile Maker allows you to quickly upload a new profile picture, move the photo around inside the frame(s), and then seamlessly “extend” the image across the row of recently-tagged photos.